Many of the Medieval cathedrals of Europe were constructed over many centuries under the direction of a series of Master Builders or Architects. Often these Master Builders were buried in the cathedral and many of them were women. Medieval reords also confirm that many of the skilled stonemasons, or fellows of the craft, were also women. Construction of Cologne Cathedral began in 1248 and was completed 632 years later. Cologne cathedral employs the best stonemasons of the Rhineland for constant repair and maintenance work. The current Master Builder of Cologne cathedral is Barbara Schock-Werner. 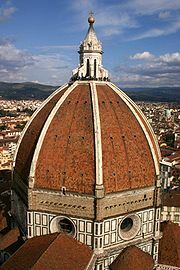 Filippo Brunelleschi completed the dome of the Basilica di Santa Maria del Fiore in Florence in 1436. This dome remains a remarkable feat of design and engineering and marked the recovery of building technology lost after the fall of Rome. bear witness to his superb skill. buries him here in the soil below. The tomb of William Schaw lies within Dumferline Abbey. As Master of Works to James VI of Scotland, Schaw was an important figure in the development of freemasonry. Sir Christopher Wren was buried in St Paul's Cathedral. As Surveyor General to Charles II, he supervised all work on the royal palaces. Wren is best known for the design of St Paul's Cathedral between 1675 and 1708.